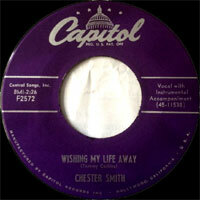 Chanteur Country US né le 29 Mars 1930 à Durant (Oklahoma), Chester Smith a débuté en 1953 en enregistrant des chants sacrés et de la Country Music. Elu en 1955, meilleur nouveau chanteur Country, il se mit au Rock 'n' Roll en 1957. 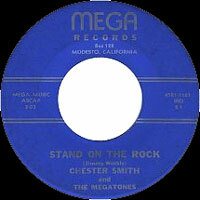 Il fut un chanteur régulier sur KFRE-TV (Fresno, Californie) et sur KCRA-TV (Sacramento, Californie) en 1957. Il fut aussi Disc Jockey sur KTRB (Modesto, Californie) en 1959. 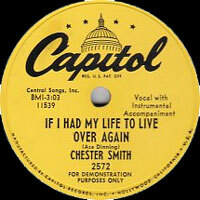 Chester Smith est mort le 8 Août 2008 à Palo Alto (Californie). 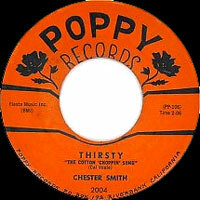 While never earning the recognition or acclaim afforded fellow Bakersfield sound exponents like Merle Haggard or Buck Owens, country singer Chester Smith remains best remembered for originating the oft-covered "Wait a Little Longer, Please Jesus" but enjoyed his greatest success as a media mogul, founding a broadcasting empire that revolutionized Spanish-language programming in the U.S. Smith was born March 29, 1930 in Durant, OK. His family fled the Dust Bowl for California in 1935, and settled in a migrant camp outside of Fresno. Smith launched his performing career at age nine, singing Gene Autry songs on Fresno radio station KMJ, In 1942, the family settled in Modesto, where he became a fixture on local station KTRB, at 16 dropping out of school to host his own daily program. 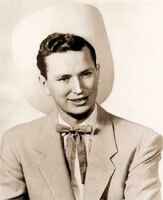 Slated behind future country legends the Maddox Brothers & Rose, Smith licensed his own air time by selling advertising inventory; the show quickly earned a devoted fan following, and he remained with the station for over 16 years, over time welcoming guests spanning from Hank Williams to Lefty Frizzell to Johnny Cash. The program was also a launching pad for emerging talents including Haggard, Owens, Marty Robbins, and Del Reeves. Though still a minor, Smith formed his own band in 1951, headlining area venues including the Riverbank Club House. In clubs where liquor was served, the group simply performed without him. Smith signed to Capitol Records in 1953, scoring the biggest hit of his career a year later with "Wait a Little Longer, Please Jesus," co-written with local housewife Hazel Houser -- a massive country-gospel hit, the song was later covered by acts including Bill Monroe, Carl Smith, Porter Wagoner, and the Louvin Brothers. Despite the success of "Wait a Little Longer," Smith's recording career sputtered. 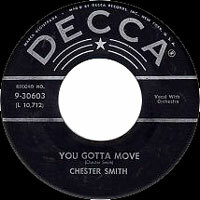 In 1958, he signed to Decca to release the rockabilly effort "You Gotta Move," followed a year later by the Poppy label single "Tennessee Saturday Night." Both records faltered, but he remained a top draw on radio, exiting KTRB in 1963 after earning a license to build his own country radio station in the Ceres area. KLOC went live on air on October 17, and in the years to follow Smith regularly cited early inspiration Autry as the model behind his transformation from entertainer to entrepreneur -- he promoted the fledgling station by hosting his own live music show on television's KOVR, and on August 26, 1966 KLOC launched its own television operations as well. Most significantly, Smith was the first broadcaster to actively cater to the programming demands of California's fast-growing Mexican population, partnering with the Spanish International Network to introduce northern California's first Spanish-language programming. While rival broadcasters roundly mocked the concept of a UHF channel catering to migrant laborers, KLOC-TV quickly became one of the most influential channels in California, over time increasing its power to 5 million watts and introducing a full-color programming lineup -- even as the Spanish International Network expanded across the state and into northern Nevada, KLOC remained its flagship station. In 1981, Smith sold KLOC radio, channeling the revenues into a second TV station, Salinas-Monterey channel KCBA; 15 years later, he sold KLOC TV to SIN for $40 million cash and another $45 in stock. Upon completing the deal, SIN changed its brand to Univision, which continues as the premier Spanish-language media conglomerate in the U.S. market. Smith did not exit the broadcasting business entirely, however -- he remained at the helm of Modesto-based Sainte Partners II, which under the Eureka Television group banner owned and operated 13 stations spanning from Oregon to Bakersfield, all of them under his personal supervision. While visiting the firm's station in Redding, Smith went for lunch with longtime friend Merle Haggard, a resident of the area -- together they hatched plans to collaborate on a recording session, with Haggard offering up his home studio and production expertise. More than four decades after his last official release, the 72-year-old Smith issued his comeback LP California Blend in 2002 -- the collection of traditional country-gospel favorites featured Haggard's harmonies on a number of tracks, most notably a haunting rendition of Roy Acuff's "Wreck on the Highway." Later that same year, Smith was honored with the Modesto Area Music Association's Lifetime Achievement Award -- other honors include the Christian Country Music Association's Pioneer Award. In 2005 he and his wife, singer/songwriter Ann Lesley Smith, collaborated on the full-length Captured by Love -- from the grounds of their 156-acre estate, the couple also harvested olives and grapes, and produced and marketed their own brand of olive oil under the Olivewood Estate brand name. Smith died of heart failure in Palo Alto, CA on August 8, 2008. He was 78.